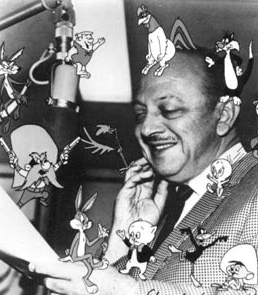 Ah, Mel Blanc. “The Man of A Thousand Voices,” and among them Bugs Bunny, Daffy Duck, and literally hundreds of other cartoon characters. As posted previously, Art Babbitt celebrated his 50th year in animation on May 25th, 1974. He was roasted by giants of the animation industry, M.C.’ed by voice actress June Foray, with opener and closer Chuck Jones. Mel got to know Art when Art was directing animated commercials at the Hanna Barbera in the 1960s , and Mel took Art’s direction as the voice of Barney Rubble. This entry was posted in 1946-1970s: Later Years and tagged 1970s, Art Babbitt, June Foray, Mel Blanc, Women. Bookmark the permalink.